Video conferencing is rapidly changing the way business is done worldwide. Once an expensive and unwieldy network to set up and run, advances like cloud based conferencing have made installing video conferencing a streamlined and hassle-free experience. You may have heard about the myriad of benefits video conferencing can bring to your business and your customers, but there’s another incredibly important group that benefits from video conferencing: your employees. 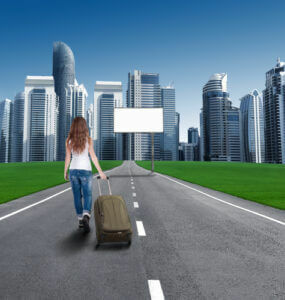 Woman walking on the road to the city, in front of an empty billboard concept. Moving to the city. Billboard on the road leading to the city of skyscrapers. Back view. Photo courtesy of Shutterstock. So you finally made it. You have conquered the long and strenuous road known as college. With your degree in one hand and ambition in the other, you hit the job market full steam ahead. As a young cultivated individual, there should be no problem landing a job, right? I wish that were the case. No matter how long you have been on the scene, finding a new job can be exhaustingly difficult, but, jumping at the first available opportunity is not always the optimal decision for your career. Especially if relocating for the job is a requirement.